The Marshman Music Master radios are not from Mars; they are from the ‘Marsh – Bacchus Marsh. We have a Marshman Music Master radio as part of our static display within the Blacksmith’s Cottage. The Marshman has a beautifully styled small box shape with a Bakelite base and camel coloured leatherette case. The glass window displays the intricate “map” of the radio stations of the 1940s. In its day the Marshman was the centrepiece in the sitting room, lounge or kitchen. 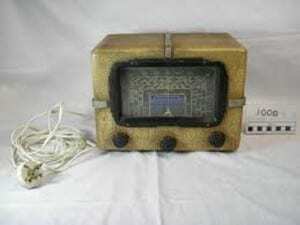 Unlike the cabinet radios of the previous decades, the Marshman was a portable radio. The Marshman was designed and manufactured at 132 Main Street, Bacchus Marsh, where local people were employed; initially in the shared shop front and then, when the Marshman’s popularity increased, they were manufactured in a factory built at the rear of 132 Main Street by the Arbee Supply Co. of Bacchus Marsh, Victoria. From about 1945 to 1949, nearly 4000 Marshman radios were manufactured at this site. The founder of the company was Robert Butler (Bob) hence the name Arbee. Arbee ceased Marshman manufacture when radios became more readily available. Arbee then became the agents for STC (Standard Telephones and Cables) and eventually sold and serviced the whole range of STC products including the increasingly popular Television sets. There were three basic types of Marshmans – a 4-valve reflex, a 5-valve MW and 5-valve MW and SW. The 4-valve set came in two styles, a timber case and leatherette case.